Certificate of Entitlement (COE) premiums ended mostly lower Yesterday (Nov 21) in November’s second round of bidding. 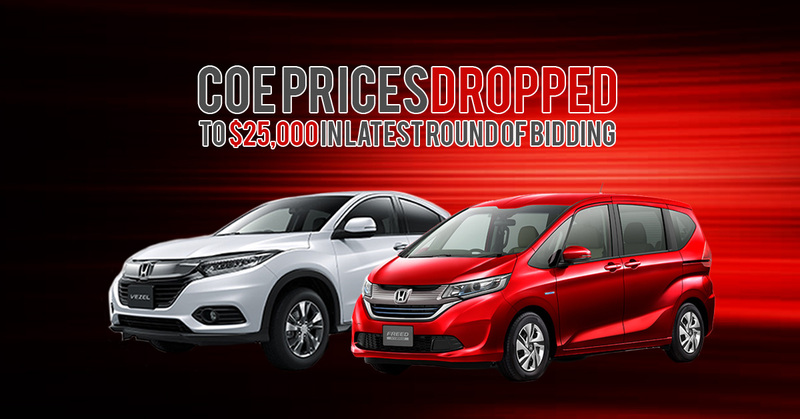 The biggest drop was seen in premium of Category A (cars up to 1,600cc or 130bhp) with prices falling from $28,199 to $25,000. Premiums for Category B (cars below 1,600cc and 130bhp), C (commercial vehicle) and E (open category) also dropped from $29,501 to $27,509, $27,509 to $29,501 and $30,959 to $32,000 respectively. The only premium that increase in the latest round of bidding is Category D (motorcycle) from $2,509 to $2,989. The drop in Category A COE premium is mainly due to an increase in quota as compared to the previous quarter. In addition to the increased in quota, the new vehicular emissions scheme (VES) introduced in July this year has also somewhat contributed to the dampening of demand in the new car market. As reported by The Straits Times in September, only about 15% of new cars registered qualified for rebates under the new scheme. Most popular cars that are entitled to $10,000 rebate under the old scheme now has a surcharge of $10,000 under the new scheme. Despite the surcharge imposed under the new VES scheme for new cars, Cars & Stars is still able to keep the sale price of new cars low. Get a new car starting from $64,888. Check out the full collection of our cars at our showroom at 50 Ubi Ave 3 #01-01/02 S(408866).